While awaiting my turn at the barbershop, the AARP Magazine cover stared back at me from its rack. Okay, it wasn’t really a barbershop. It was a salon, But not just any salon. It was one of those franchise salons for cheapskates like me who carry around coupons for discount haircuts. “Ten Essential Boomer Albums,” the headline read. I grabbed the magazine, rescuing it from between Glamour and People. I flipped through some pages to the list of records. “Alright,” I muttered to myself. I owned nine out of those ten albums! The first one was Bob Dylan’s Highway 61 Revisited. I had that one… until someone “borrowed” it from me, along with a Simon & Garfunkel album not on the list. Never saw either one again. I first heard “Like a Rolling Stone” on my cousin’s transistor radio while we were fishing along the banks of Turtle Creek. Now, I have nearly every Dylan album ever released, even the “borrowed” one. Dylan’s music probably has influenced me more than any other songwriter. Long ago, I wrote about the second album on the list, the Beatles’ Sgt. 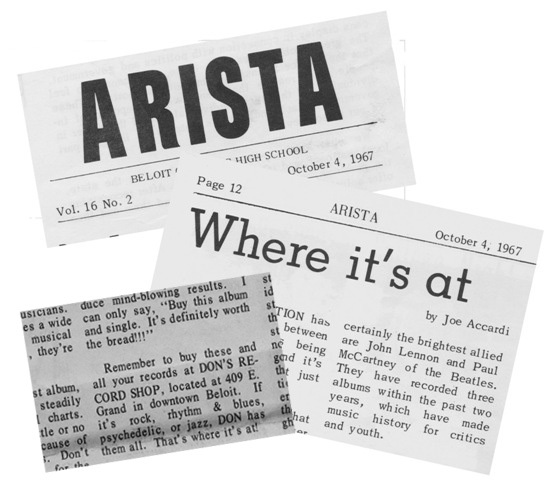 Pepper’s Lonely Hearts Club Band, for a review column in my high school newspaper, Arista. In that same column I also reviewed We’re Only in It for the Money by the Mothers of Invention. That one isn’t on the list for reasons unknown to me. I have some clippings of those record review columns. Each of them ended with a plug for Don’s Record Shop. A classmate on the business end of the newspaper staff was supposed to collect money from old Don in return for the advertising. Whether that actually happened remains a mystery. On the other hand, I don’t recall ever buying record albums at retail prices from Don. Ever the cheapskate, I sought out the record bins at Arlan’s Discount Store. Karma triumphed on Don’s behalf though, when both albums warped beyond playability in the trunk of my parents car one sunny afternoon, the result of my own negligence. I had to look up Led Zeppelin IV. Zeppelin never bothered to title their first four albums and even though three of them were in my collection, my head hurts trying to recall anything after Led Zeppelin II. To make matters more confusing, this fourth album goes by an alternate title comprised of four Runes symbols, each representing a band member. So I remember it only by its cover art featuring an old guy hunched over and carrying a bag of sticks. It’s also the album with their most overplayed song, “Stairway to Heaven,” and is one I wore out on my turntable. What’s Going On (Marvin Gaye), Tapestry (Carole King), Exile on Main Street (Rolling Stones), Innervisions (Stevie Wonder), Eagles: Their Greatest Hits 1971–1975 (Eagles), Exodus (Bob Marley & the Wailers) and Saturday Night Fever: The Original Movie Soundtrack (Bee Gees) made up the rest of this “essential” list. Saturday Night Fever? Really? I confess to seeing the movie, but never thought seriously about owning the soundtrack album. I was miffed by the “disco” wave the Bee Gees chose to ride. The Bee Gees had made some decent music and their first album, appropriately titled Bee Gees 1st, was in my collection. But their Odessa album with the red-flocked, gatefold cover was the real gem. Either my first wife or her sister owned that album, depending on whose home it was in at the time. An oft-pilfered item between them, it finally met an unfortunate fate, melting into a charred hunk of red-flecked vinyl, the result of a house fire while in my sister-in-law.’s possession. So the AARP music critic and I might agree on nine out of his ten essential boomer albums… all ten if you take into account a different Bee Gees album that burned to a crisp. I could easily come up with a different “Ten Essential Boomer Albums” list. There’s a very good chance none would have been purchased at Don’s Record Store. Sorry, Don. What are your “Ten Essential Boomer Albums?” Leave a comment and let me know. Love yer blog, o former best neighbor!